An environmentally friendly, non-flammable pigmented retarder designed to produce an exposed aggregate surface which gives an excellent key for subsequent concreting or surface treatments. Ideal for construction joints and rendering applications. Eliminates the need for expensive and detrimental bush hammering. Hard abrasion resistant film which is not easily discplaced during concrete placement. Can be applied onto all types of formwork both absorbent and non-absorbent. Water based and has very low odour. Ideal for areas of poor ventilation. Pigmented white to assist in uniform application. Surface produced provides an excellent key for subsequent treatments. To download the Aquatard Formwork Retarder Technical Datasheet click here. 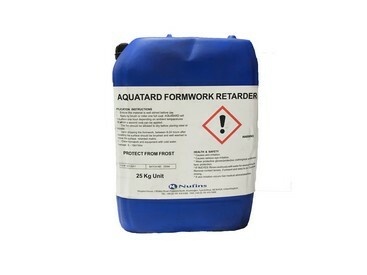 To download the Aquatard Formwork Retarder Safety Data Sheet click here.